Play the best mobile online slots at Uptown Aces Casino with a special 150% bonus up to $1500. Redeem the coupon code 150GADGET to claim your mobile bonus up to $1500. While you're at it, don't miss our private $200 NoLuckNeeded July Freeroll at Uptown Aces (password NLNSUN). Good Luck! No Maximum cashout! $25 minimum deposit. $1500 maximum deposit. 30x wagering; Standard bonus rules apply. Redeem the coupon code in the casino cashier's coupon section BEFORE making your first deposit. 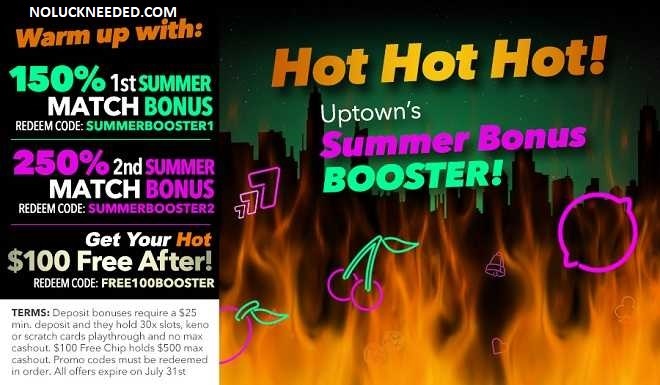 Claim your July Summer Booster Bonuses and $100 Free Chip at Uptown Aces Casino!